① WHY WE STOPPED TEACHING CHILDREN TO READ | ② READING & TEACHING 'WARS' | ③ HOW WELL DOES AMERICA READ? 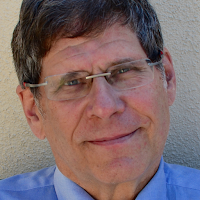 Mark Seidenberg is a cognitive scientist who has studied reading since the disco era. Along with a large community of peers in his field, Mark has figured out a lot about how reading works, how children learn, the factors that determine reading outcomes, the kinds of instruction that are crucial, the causes of reading impairments and how they can be addressed. Although what we know about reading has grown enormously, American parents continue to be anxious about how well their children are being taught to read. They should be. The NAEP (Nation’s Report Card) and PISA cross-national assessments attract the most attention (and controversy), but every such survey shows that a large percentage of the population has only basic reading skills. Mark believes science can contribute to improving literacy outcomes in this country. Very little of what we’ve learned about reading as scientists has had any impact on what happens in schools because of a deep disconnection between the cultures of science and education. This gulf has been harmful. Methods commonly used to teach children are inconsistent with basic facts about human cognition and development and so make learning to read more difficult than it should be (for example, emphasizing the inefficient strategy of guessing words as they come along). They inadvertently place many children at risk for reading failure (by leaving children to discover skills that could be taught). They discriminate against poorer children (because practices assume access to resources such as the Internet). They discourage children who could have become more successful readers. Many children who manage to learn to read under these conditions wind up disinterested in the activity. In short, what happens in classrooms isn’t adequate for many children, and this shows in the quality of this country’s literacy achievement. What can be done? Some thick, heavy walls need to come down, which won’t happen without enlightened intervention. The alternative is to keep going back to educators for solutions to problems they have helped to create and maintain. ② Why are There 'Wars' about Reading and Teaching? Life after wartime: what happened to reading after the “reading wars” ended? In 2010 a columnist in the WSJ declared that the US was experiencing a second “Sputnik moment,” following the release of the latest results from the PISA, the massive international reading assessment. As in previous years, the US students performed in the middle of the pack in reading, as well as in math and science. The results were taken as a wake-up call about the dismal state of US education, a theme the president took up in his state of the union address a month later. The Sputnik moment was an occasion to look closely at educational practices to see how to help more children succeed. The reading wars, the decades-long debate between educators and scientists about how reading works and children should be taught, suggested a need to look closely. The “wars” about how to teach reading ended with the adoption of “Balanced Literacy,” a compromise between “phonics” and “whole language” approaches. Balanced Literacy diffused the debate and maintained the status quo. How reading is taught now receives even less attention than before because educational theorists have moved on to a newer concept: “multiple literacies”. Traditional reading and writing are now seen as only one of several “literacies” created by screen technologies, including ones that do not involve print at all. Closing achievement gaps between the US and other countries, or between groups in the US is not seen as an important goal because reading is on its way to becoming a legacy technology anyway. An educational philosophy that does not treat traditional reading as fundamental will make it harder to gain this skill, with the greatest impact falling on groups already at risk for reading failure. Since advantages continue to accrue to those who can read, it seems essential—a moral imperative, even—to hold educators to developing children’s reading and writing skills. ③ How Well Does America Read? 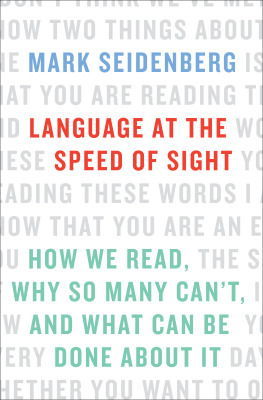 Mark's book, Language at the Speed of Sight, examines current controversies about reading achievement in the US. There is a vast body of evidence from multiple sources showing that although the US educational system works well for many, there is a high proportion of low achievers (in reading, but also math, and science), much higher than in countries such as Canada, Japan, Korea, and Finland. We are also doing less well than expected given our economic advantages. No Child Left Behind was a flawed response to a real problem: the educational establishment’s inability to recognize or address the problems in its own house. Those problems remain, but the causes are debated. Educators (the leading figure here is Diane Ravitch) argue that the educational system works exceptionally well, better than ever, and that legislative interventions such as NCLB were not only bad policy but unneeded. The low achievers are low income, mainly minority, children. US performance compares favorably to other countries if these children are excluded. Thus, low achievement is due to inequalities in opportunity, a social justice issue not an educational one. The way to improve achievement is to address the poverty problem. Mark takes issue with these claims, which raise fundamental questions about the functions of public education. Of course poverty is important and has a huge impact on education and much else. Reading achievement would surely increase if poverty were reduced. But focusing on poverty draws attention away from what can be done in the meantime, and the role of education in particular. Socioeconomic status affects people’s lives via various associated conditions that differ in susceptibility to change, many of which are education related: access to quality schools, public libraries, computers, and the Internet, among other things. Educational practices can magnify differences in SES, as when they are predicated on the availability of resources outside the classroom. Education may not be “the great equalizer” but it can act as a protective factor against disfavorable circumstances. The focus on SES creates a “Waiting for Poverty” attitude that outcomes can’t change until poverty is eliminated by superhuman effort. A narrow emphasis on poverty can be seen as a way to relieve the educational establishment of responsibility for educational failures, offering a context for plausible denial. This is particularly worrisome because of the large number of children involved: over 50% of public school children now qualify for free or reduced price lunch. Rather than focusing on the undeniably large role of poverty in poor achievement, we might also focus on the undeniably large role that education could play in improving outcomes. Mark Seidenberg is Vilas Professor and Donald O. Hebb Professor in the department of psychology at the University of Wisconsin. He is a cognitive neuroscientist who has studied reading and dyslexia since the disco era. He grew up in Chicago, where he attended the University of Chicago Laboratory School, founded by John Dewey in the 1890s as a laboratory to work out his philosophical ideas. Seidenberg received a Ph.D. and a few other degrees from Columbia University in New York, where he lived for a time with Nim Chimpsky, a chimpanzee who was being taught sign language and mostly talked about food, a shared interest. His reading research addresses the nature of skilled reading, how children learn to read, dyslexia, and the brain bases of reading, using the tools of modern cognitive neuroscience: behavioral experiments, computational models, and neuroimaging. His 2017 book, Language at the Speed of Sight: How We Read, Why So Many Can’t, and What to Do About It, describes the disconnection between reading science and educational practices, which makes it more difficult for children to become skilled readers, and how it could be overcome. His current research focuses on how differences in language experience contribute to achievement gaps in reading, and how they could be addressed. He lives in Madison WI and prefers print versions over e-books, except for travel.